I was involved in the design of this application, so I won’t call this an unbiased review. However, as a parent, teacher, and teacher educator, I have an opinion on how to help kids learn to tell time, and couldn’t find the perfect app to support this process - so we had to build one. Inside the app there are information tabs to support parents and teachers in helping children to learn to tell time using the app – I’ll present a condensed version of these ideas here. There are several challenges associated with mastering time: children have to come to understand that there are 60 seconds in a minute, 60 minutes in an hour, and 24 hours in a day, they need to learn to read time on a traditional analogue (or analog in US spelling) clock, and they need to recognize that the hour names are recycled twice each day. All of these can be a bit of a struggle for young children who have just mastered the number system where each place value was 10 times as big as the last and 100 follows 99 in the natural order of things. We have designed clock-master as a game to help children to make the connection between hours and minutes and to help them to become fluent in both reading and setting time on digital and analogue clocks. Parental or teacher/tutor involvement in the process is essential. Before focusing on this application it is recommended that children have some basic skills. Your child should be familiar with the number system and be able to read numbers fluently up through 100 and recognize the relative size of numbers (e.g., that 43 is greater than 37). Your child should also have had some exposure to both digital and analogue clocks in the real world – to help them to make connections between the clocks in this application and the real world. If your child struggles too much to play this game then it may be too soon for them to be using it - set it aside until they are ready. This mode is designed to give children an opportunity to explore the relationship between time shown on an analogue clock and time shown on a digital clock. Any adjustment made to either of the clocks is echoed on the other (move either of the hands on the analogue clock or spin the digits on the digital clock). Work one-on-one with your child in this practice mode until they become comfortable with the relationship between hours and minutes on both clocks and are able to read each hour is a good place to start. Some discussion may be necessary to help your child understand that the hours are ‘recycled’ so that after 12, the next hour is 1 and after 2:59 is 3:00. Sound – A positive tone is heard whenever your child does well. When things are going less well, a more neutral tone is played. The sound allows you to monitor your child’s progress from a short distance and be ready to intervene if success is elusive. Difficulty – ‘Easy’, ‘Medium’ and ‘Hard’ – The ‘Easy’ level challenges children to work with the easier times with minutes set to 0, 15, 30 or 45, and constrains the movement of the clocks to these values. The ‘Medium’ level challenges children to show times to the nearest 5 minutes and ‘Hard’ requires children to show times to the nearest minute. It is suggested that children should master the ‘Easy’ level in each of the play modes – find digital, and find analogue – before moving onto the next level of difficulty. Play Mode – Find Digital and Find Analogue – The process of translation needs to work both ways for children to be fully prepared to work with clocks in the world. In ‘Find Digital’ mode the child is challenged to read the analogue clock and adjust the digital clock (hours and minutes move separately) to match. Similarly in ‘Find Analogue’ mode the goal is to read the digital clock and then accurately position the hour and minute hands of the analogue clock. Clock Face – This setting allows the you to adjust the face of the analogue clock to show a) a regular clock with 60 tick marks, b) the same clock with every 5 minutes shown on the outer bevel, and c) the same clock with every minute inscribed on the outer bevel. It is suggested that you begin with the enhanced clock face and then gradually decrease the level of detail presented on the clock face until your child is able to achieve success with just the regular clock consistently. Each game consists of 10 rounds in each round a time is displayed on one of the clocks and the player finds (sets) the time on the designated clock (a glowing blue arrow or face reminds your child which clock is being manipulated at the beginning of each game) and presses the ‘check’ button. After the check button is pressed, the game timer is stopped until your child decides to move on by pressing ‘next’ – this allows them to take as much time as they need to review their answer and reflect without feeling the pressure to move quickly to the next question. In this review mode the correct time is displayed on both clocks, but your child may tap and hold the screen to flip from the correct time on both clocks to a second screen that shows the time that they entered on both clocks – with the message ‘you entered’ displayed at the top. In order for your child to enjoy math – it should make sense! Children don’t learn about mathematics from the quick ‘just do this’ solution – rather they learn by exploring and understanding. Start by focusing on the simplest clock values first, emphasize sense-making and accuracy (can they get perfect scores), then encourage your child to improve their speed. If your child doesn’t seem to be ready or doesn’t respond well to the program – set it aside until they are ready – and try another game or activity. This game is not designed to replace other activities that will support learning about time – it is just a supplementary tool to support the process. Regularly discuss with your child what they understand or what they are struggling with as they are playing the game (the feedback they give you can be very helpful), challenge them to read clocks and watches around the house and car and be sure to discuss other ways we use to describe time (e.g., about 3, quarter after 8, ten to 4, am and pm, etc.). To help your child learn it is best to have them focus on getting good scores rather than completing the game quickly. Once your child is able to earn close to perfect scores at a given level (say 45/50 or better) then you might challenge them to work on speed while maintaining accuracy. You are encouraged to play the game yourself in order to better understand the thinking that your child is doing as they play and to develop a sense of what might be a reasonable goal for your child with regards to fluency. As a classroom activity (if you are fortunate enough to have a collection of ipods available for this purpose, or in a small group setting with just one) – you might start by exploring a physical clock first and then moving onto using this app. The practice clock might be used to explore and discuss the relative movement of the minute and hour hands and the corresponding times represented on the digital clock. Carefully examine how the minute hand moves when the hour hand is manipulated (note that we cannot do this with physical geared clocks, but in software we can) it is a useful tool to support understanding. Next, you might have the students work through a couple of games in pairs (have them set up the game to match their ability/experience first) while sharing their ideas with a partner. Then bring the class together and present some examples on the overhead (hold power down and tap on the home button to take a snapshot of a screen), and ask them to share some of the challenges that they experienced, strategies they used, and questions that they have found effective. This sharing of ideas and language in the group setting will reinforce helpful ideas and language usage, allow students to self-correct erroneous ideas and provide students with new words and ideas to use as they continue in the activity. After the discussion, let the students play a few more games and then challenge them to explain some aspects of the analogue and digital clocks as a journal entry. Look for ways to help your students to transfer their learning by making connections between the time that they are reading on clocks and the time that they experience. Discuss and explore the passage of time during activities and emphasize the use of the clock by setting specific start and stop times. Bring in activities for examining elapsed time and help them to see that both a timer and a clock can be used to support the measurement of these times. After students have become familiar with the app, a sponge game might be developed with students challenging their classmates to set a particular time in practice mode - using common, uncommon, accurate or inaccurate terms for time (almost 10, quarter past 5, twenty to 8, bedtime, etc.). Once your students are familiar with Clock-master, you might challenge each of them to improve their level of mastery and fluency in each of the modes as a ‘center’ activity. It is important to emphasize to the children that we all learn differently, that accuracy is more important than speed and that the goal of the activity is not to have a race between students, but rather it is a challenge to improve as individuals. If a child is struggling to master clocks with this application – find another resource that makes more sense to them. If your goal is to help your child to master the traditional subtraction algorithm then Column Subtraction may be the ideal App. I first became aware of this app a couple of weeks ago after reading an article and searching out a news release on prMac.com. In the release the developer, Esa Helttula, explains that he could not find any apps which would support his daughter in practicing column addition, and as a result set out to generate apps to provide users with an opportunity to practice of traditional algorithms for column addition, column subtraction and long multiplication. He explains that his focus was on minimizing button presses and not penalizing wrong answers. This review focuses on only the Column Subtraction app – but the other apps appear to have similar construction, behaviors, benefits and limitations. The interface is clean – perhaps even sterile – but that is not such a bad thing if you are working one-one with a child and trying to discuss the important details (and a good thing if your child is easily distracted). A reference copy of the question is presented at the top of the working space in horizontal format and then on the right side a working version is presented in a vertical format, finally the current sub-operation is presented at the bottom of the working screen. Below the working screen there is a ‘borrow’ button and buttons for 0-9. The feedback is minimal but adequate – when your child selects the borrow button and borrowing is appropriate, then an animated borrowing occurs in the vertical/working version of the expression and when a numerical value is selected then it is shown at the bottom of the white space and only floats up into the answer space if it is correct. Thus your child is generally provided with feedback that their response was registered and they are given immediate confirmation if it is correct. If your child is familiar with the traditional subtraction algorithm they will likely be able to improve their mastery of the procedure using this application. With the ‘show current operation’ option turned on, they are constantly reminded of the next step, which can lead to efficient practice of the procedure. Then by turning off the current operation your child is able to practice remembering the steps on his/her own. Because no wrong entries are allowed the app provides a passive form of positive reinforcement and your child will likely improve in both confidence and competence with respect to the procedure. However, to support learning and understanding in mathematics you need to take an active role in assessing understanding and challenging your child to explain their thinking. You can support your child in using this application, by first confirming that they have an understanding of subtraction (see caveats), then working through a couple of examples with the current operation showing. By working through a series of questions with you at their side - challenging them to explain what the question might mean (understanding with a context), estimating the outcome, and then showing and discussing each of the steps and checking the answer - your child can have a productive and positive learning experience. Once your child seems to be comfortable using the application and is able to correctly identify when borrowing is necessary, then it would be best to turn off the ‘show current operation’ option. Sitting with your child and asking them explain their thinking will allow the parent to assess whether any further support is needed for them to master both the concept and the process. Once the parent is convinced that the child has mastered both the concept and process, then continued independent use of the app will allow your child to improve their fluency with the operation. Besides allowing you to turn the current operation on or off, the settings page allows you to choose to have 2 or 3 numbers in each expression presented and 2, 3, 4, or 5 digits in each number. In the BC curriculum guide children are expected to be proficient in subtracting whole numbers up to 10000 in grade 4. 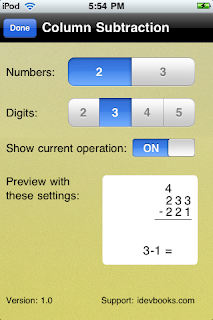 Thus the app supports a reasonable progression of starting with 2 digit numbers and moving up through 3, 4, and 5 digit numbers as the child demonstrates mastery (i.e., is able to understand, estimate, complete and check the answer in a moderately efficient manner with sub-operations feature turned off and your quiet observation). I don’t see any particular value in using the 3 values option (it's adding too much complexity for young children and a distraction), and would steer you (parents) away from it unless your child is particularly comfortable with mathematics. As a parent I like the potential that this Column Subtraction app has to help my child to master the traditional subtraction algorithm, but I have some caveats and suggestions to add to my recommendation. I urge you (parents/tutors/teachers) to support your children as they use this app and confirm that your child is understanding the process, that they are able to efficiently estimate and check the results and that they are able to visualize an appropriate context for the mathematical expression. I also encourage parents and teachers to investigate and discuss alternative approaches and algorithms with their child. It is important that children understand what they are doing before learning rote procedures – otherwise the learning achieved will be unconnected to other knowledge, fragile and irrelevant to their lives. Children should be able to represent and solve subtraction related problems in the physical and visual (i.e., pictures) realms before they are pushed to begin manipulating symbols. To check this, ask your child if they can come up with a reasonable story or two to interpret the symbolic expressions presented in the app, and see if they can show you the process with some physical representations (beans, base-ten blocks, etc.). If they can’t easily generate an example, provide them with some and then spend some time helping them to make sense of where these expressions might come from (e.g., given 73-58 the child might say “I have earned $73 doing chores over the past month and spent $58 on a LEGO set – how much do I have left over?”).